Hickory Dickory Doc, you’re going to like the one with the BLUE label a LOT! Try Wicker’s Hickory Flavor Marinade & Baste for a new twist to the same ‘ol dinner. Hickory might be one of the hardest woods you can find, but this Marinade will make dinner easy. Why? You’ll need to try it yourself, but we describe it as an aromatic, rich and faintly sweet flavor. 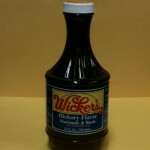 Wicker’s Hickory Marinade & Baste is hand-crafted in Hornersville, Missouri, USA. It’s is made by starting with our secret formula of spices in a vinegar base and contains no sugar or oil…then we add the special flavoring that makes this worthy of being dubbed “Hickory”. Wicker’s Hickory Marinade & Baste is made for both long, slow smoking and quick grilling. Here in the South, barbecue means meat smoked at low temperature for hours until it is mouthwateringly tender. Wicker’s Hickory Marinade & Baste was created for this purpose. But what if you don’t have “hours”? What if you only have a few minutes to make a healthy dinner? Good news! Wicker’s Hickory Marinade & Baste is also made for marinating meats for grilling over high temperatures for a short time period. So, whether you have hours or minutes, Wicker’s Hickory Marinade & Baste will help transform an ordinary bbq into an extraordinary bbq! Bonus! On a special diet? Wicker’s Hickory Marinade & Baste is friendly to diet plans that limit the intake of carbohydrates, such as the Paleo Diet, Caveman Diet, South Beach Diet, Adkins Diet, etc.